Sean Connery is James Bond the British spy 007 who is sent to Jamaica to investigate the death of another agent. His investigations lead him to an island run by Dr No where he meets Ursula Andress. This was the first of the James Bond 007 films and one of the best films in the series. This is more of a spy film with a plot, rather than the later films which are more more gadget and stunt orientated. 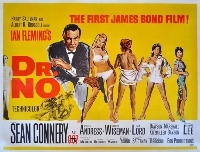 This film is though perhaps best remembered for the scene of Ursula Andress coming up out of the sea in a white bikini and for the first use of the line "The name's Bond, James Bond"
"The name's Bond, James Bond"